AddSearch is an instant search for websites that gives results immediately, from the first keystroke. 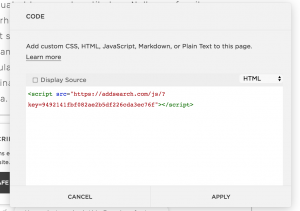 The easiest way to implement AddSearch on a Squarespace site is to use Addsearch’s Quick method, and insert a single line of HTML by putting a Custom Code element on each page that you want to include the search engine. If you have a lot of pages, this might be a bit of work. Log into your Squarespace site, and open the page where you want to install the AddSearch search bar. and then clicking on it. This will bring up a text field window. Remove the Hello world and replace it with the script from step 1. (replace SITEKEY with your own key). Click Apply and Save the changes on the page. Done! 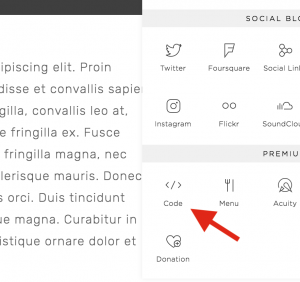 Note: While in editing mode, SquareSpace will disable the script, but you can preview it in safe mode. You can see it in action by logging out or visiting your site in another or incognito browser.